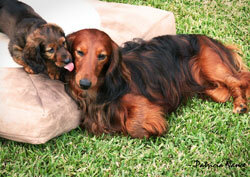 Teo is a standard red longhaired dachshund bred by Inge Bruno Thomsen (Kennel Basotto) in Denmark. We helped bring Teo to the US in fall 2014 and co-own him. 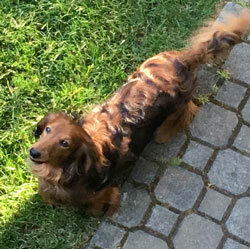 He first lived with Patt Nance and is now much loved by his new owner, Patty Rothhaar in Ohio. 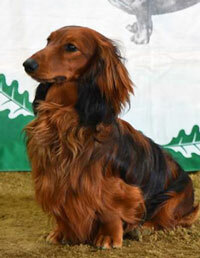 Teo's sire is Hound's Space Boy, the son of Hound's Uncle Tom, who is also the grandfather of Bossa's father Hound's Uncle Sam (all bred by Marie Gadolin in Sweden). 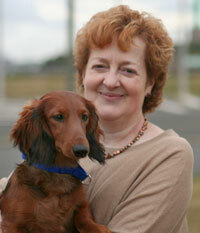 Teo's mother is Tia von der Taunushöhe, from the prestigious German Taunushöhe kennel. 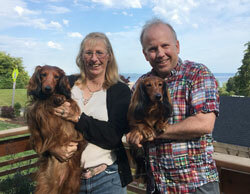 Patty brought Teo out to Seattle in June 2018 to breed to Bossa. The result was five beautiful puppies! Teo and Diane at Liberty Park on Teo's first day in the US (Sept 2014). Teo with one of the puppies from his first litter (with Tranevangs Ma. Tashatax) in September 2015. Teo with Patty (left) and Bossa with John (right) in June 2018. Teo in our yard looking up at Bossa, during his visit for breeding in June 2018. 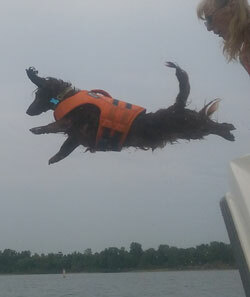 While Bossa was having puppies, Teo was having fun dock-diving with Patty (August 2018).